Imagine how tired you'd be of eating the same thing for breakfast, lunch and dinner, day after day after day. If you're feeding your hermit crab the same food all the time, he's likely to be a little tired of it. Sheldon would probably enjoy a little variety in his diet. In their natural environment, hermit crabs dine on a variety of foods, including decaying wood, grasses, plants, fallen fruit and things washed on shore from the tide. They're not fussy and are usually open to trying just about anything that gets their attention. You can experiment with Sheldon and offer him a few things from your breakfast plate, such as some scrambled eggs, or try a piece of popcorn on movie night. There will be some trial and error to learn what Sheldon likes, but most hermit crabs have a sweet tooth. The Hermit Crab Patch notes that baby food is popular, particularly fruit flavors such as fruit medley, apples and bananas, mango fruit, guava fruit, sweet corn casserole, sweet potatoes and apples and applesauce. If you want to avoid baby food and use fresh fruits and vegetables, try blueberries, mango, banana, pineapple, grapes, sweet potatoes, carrots, corn, spinach, apple and broccoli heads. Walnuts, peanut butter, fresh rose or sunflower petals, honey, oatmeal and wheat germ offer a nice change to fruits and vegetables. Sardines, blood worms and meal worms are appealing, as is the meat you eat. If you give Sheldon meat, make sure it's not seasoned with any spices or table salt. If you don't eat processed foods, you can probably share much of your food with Sheldon. However, if you eat processed foods, keep them to yourself. The sugar and table salt in them can be harmful for him. If you give him edible flowers or grasses, make sure they're from flowers that haven't been treated with fertilizers or pesticides, which can make him sick. If you aren't able to feed him organic produce, the fruits and vegetables he eats should be washed with dechlorinated water. Since hermit crabs are game to try anything, you should be cautious of what you put in Sheldon's crabitat. 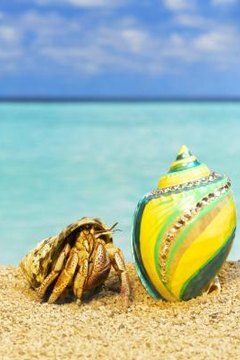 Although pretty, painted shells can be dangerous for crabs; eventually the paint will chip off and he may ingest the flakes. You may want to keep some commercial hermit crab food on hand to ensure he gets the nutrition he needs. Some crabs will stash food in their crabitat, which mimics hermit crab behavior in the wild. Keep an eye -- and a nose -- open to make sure it doesn't stay in the cage too long and start rotting. The Crab Street Journal: FAQ: Should I Feed My Hermit Crab Meat? What Can You Feed Crows? How Much Should a Shih Tzu Puppy Eat? Can Crested Geckos Eat Anything Besides Bugs? What Do You Feed a Terrapin? Can You Train a Canary? What Vegetables Do You Feed to Baby Chickens? What Does It Mean if Your Guinea Pig Nibbles on You? What Household Food Can Puffer Fish Eat? What Do Saltwater Aquarium Eels Eat?